Japanese researchers have helped discover, analyze and commercialize novel conducting materials and products, such as zirconia-based gas sensors and lithium-ion batteries. Tsukuba, Japan, Sept 12, 2017 - (ACN Newswire) - The field of solid-state ionics originated in Europe, but Japanese scientists have significantly advanced it over the past 70 years, according to a review in the journal Science and Technology of Advanced Materials (STAM). Solid-state ionics deals with all aspects of the migration of ions (charged atoms) in solids, such as ceramics, polymers, biomaterials and their composites. Despite a common belief that solids don't conduct ions, some solids with specific structural and physical properties exhibit a fast ionic conduction, which is comparable to that of liquids. Takehiko Takahashi of Nagoya University was the first to coin the term 'solid ionics' in 1967. 'Solid-state ionics' first appeared in 1971 in another of his papers, and was likely a play on 'solid-state electronics', another rapidly growing field at the time. Early research focused on characterizing the crystal structures of highly conductive materials like silver and copper compounds. Over the decades, researchers have expanded the understanding of ionic conduction in different compounds involving lithium, sodium-sulfur and perovskite structures. These findings have led to the development of a variety of sensors and batteries, many of which are designed or manufactured in Japan. For example, Sony first commercialized lithium-ion batteries in 1990, the largest commercial application of this field. Widely used in mobile electronics, lithium-ion is also being targeted for renewable energy storage, which could continue to expand the market. Japanese scientists were key in demonstrating the effectiveness of sodium-sulfur batteries. These high-energy batteries could have potential applications in renewable energy storage and electric vehicles. A Japanese company, NGK Insulators, Ltd., commercialized the batteries in 2002. Their systems have ranged from one-megawatt to 34.8-megawatts and help stabilize renewable energy production by storing excess power and providing it to the grid when demand increases. Gas sensors made of solid zirconia electrolyte are another key application of solid-state ionics. These sensors measure the partial pressure of oxygen in exhaust gas from car engines. They help to control the combustion conditions (air/fuel ratio) and minimize the emission of NOx and CO pollutants. Today, Japanese companies supply more than two thirds of zirconia-based oxygen sensors in cars. Research in the field continues towards applications in nanoelectronics. It also aims to bring down the cost of solid oxide fuel cells, which are one of the most promising technologies for generation of electric energy from natural gases, but are prohibitively expensive. 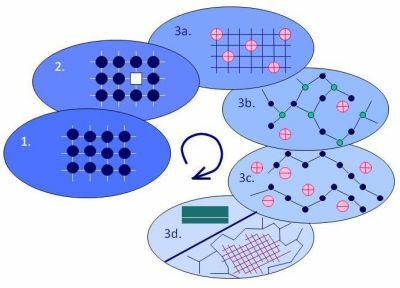 Scientists are still hoping to discover "fast, novel, and even exotic ion conductors in the solid state," according to the review's author Osamu Yamamoto of Mie University in Japan. "Solid state ionics: a Japan perspective"
Science and Technology of Advanced Materials, 2017; 18:1, 504-527. 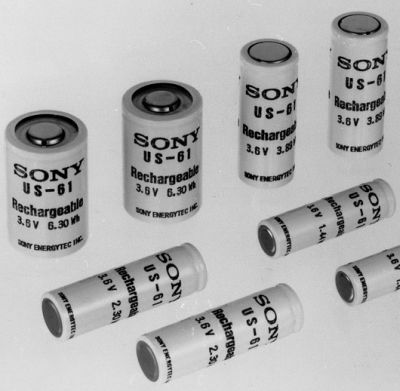 The largest commercial application of solid state ionics are lithium-ion batteries, which Sony commercialized around 1990.The lithium-ion batteries pictured were used in some of the early Kyocera cellular phones (image credit: Sony Energy Devices Corporation). 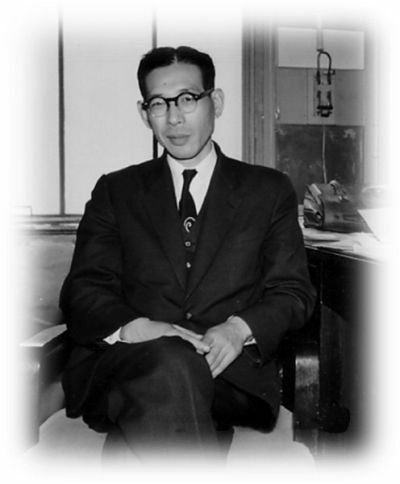 Takehiko Takahashi of Nagoya University was the first to coin the term 'solid ionics' in 1967. Evolution of materials used in solid-state ionics: 1 - ideal crystals; 2 - crystals with point defects; 3a - crystals with structural disorder; 3b - ion-conducting glasses; 3c - polymer electrolytes; 3d - nanosized systems. This figure is taken from the preceding historical review on solid-state ionics published in STAM at http://doi.org/10.1088/1468-6996/14/4/043502.